The classic Noble variety Saaz is know for earthy, herbal, spice and pleasant earthy aromas. Traditional Saaz is very low in Alpha Acids and primarily used as an aroma hop. However, brewers can also obtain a delicate bitterness when adding Saaz as an early addition. Dating back over 700 year to the City of Zatec, brewers have been using Czech Saaz primarily for Czech Pilsners. 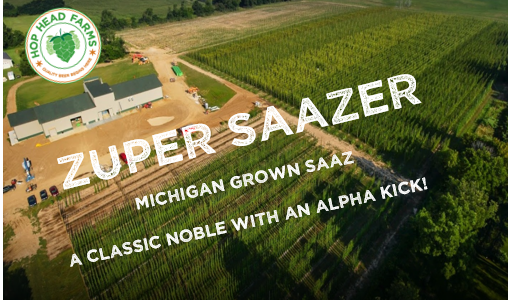 Our Michigan grow Saaz, ZUPER SAAZER has the classic herbal, floral spicy aromas with an Alpha Kick! ( 6.27% Alpha Acids compared to 3.40% in Czech Saaz ) Our Michigan Terroir and climate are perfect for growing this variety. We have seen US Craft Brewers use Zuper Zaazer in a variety of different styles. It is truly versatile variety. SHOP CZ SAAZ and ZUPER SAAZER online or contact us to get these variety to your brewery. Not a customer? Become one today.